Gullett has 25 HD Nooks available for checkout! See below for all the information. Student Nooks will not be WiFi enabled. Content may not be added to any Nook without going through the Gullett Library. 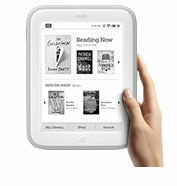 Click here to see the content already loaded and available on the Nooks. * The Nook Checkout period is two (2) weeks. * At that time, the Nook must be returned. If there is no request for that Nook, the student may renew it for one more 2 week period. * The parent will be notified, by email, when a Nook has been checked out by a student.